From storage containers to shake mixers, and even PB2 Peanut Butter, we offer many accessories to compliment your Diet Foods. 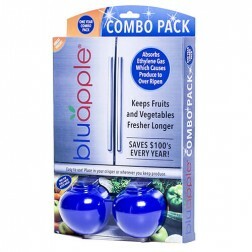 The Bluapple® One-Year Combo Pack contains a one year supply of packets and two Bluapples®. 20 oz. Acrylic double wall tumbler cup with H/C threaded lid and matching straw and infuser for hot or cold beverages. Blender Bottle® Products including Sports Mixer, Signature Sleek, Go Staks, Slings, Etc. Green, 3' 6" wide natural latex rubber resistive band used to tone & strengthen all major muscle groups for upper body, abs and lower body conditioning. Band comes with a poster of sample exercises. A collection of over 250 delicious fruit and vegetable-based recipes from patients across the country.